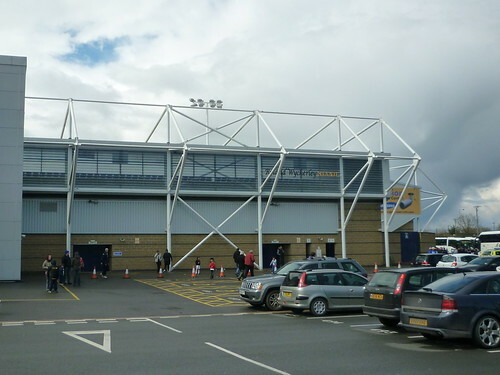 The thoughts, views, comments and opinions of Pompey fan BlueThruAndThru generated on an ad hoc basis from his vantage point in the Pompey Observatory. 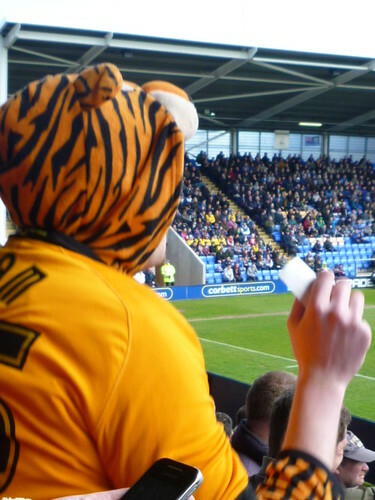 As we're about to enter another year in mid-table, League Two obscurity, here are twelve lessons for all of us to ponder. Lesson 1: when you're on a yellow card, don't get a second making a stupid foul in the opposition's half of the field. Lesson 2: stop hoofing the ball forward aimlessly from the back; it's a hoof and inevitably aimless. Lesson 3: stop using the Danny Hollands non-long-throw, long throw tactic; it isn't very long and it isn't a tactic when you do it everytime. It also wears Danny, our best player, out. Lesson 4: kicking the ball in to touch from the kick-off is a tactic best deployed in rugby union not the football league, not even League Two; we're playing for possession not position. Lesson 5: when you take the lead, kill time all the time; play dead whenever possible; tie your laces, both boots, double bows; lose an imaginary contact lense; when substituted take an obscure route to the touchline, via North End preferably. Lesson 6: always play a bald-headed, six foot plus, overweight central defender who has 250+ appearances under his belt in League Two and Conference, even if he's sh*te. 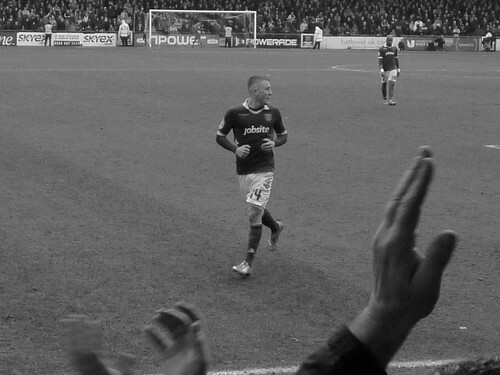 He'll always raise his game at Fratton Park. Lesson 7: trying to play tiki-taka football in League Two is like trying to polish a turd; be strong, be brave, get in there, it's football FFS! Lesson 8: if your captain can't get in your first team, he isn't really your captain. Lesson 9: if you're the manager it's your technical area to boss, nobody else's; get out there and be visible and vocal; they're your backroom team and you're their leader. Lesson 10: don't tell me the crowd attendance was 17,500 when I have more than 17,500 empty seats around me. 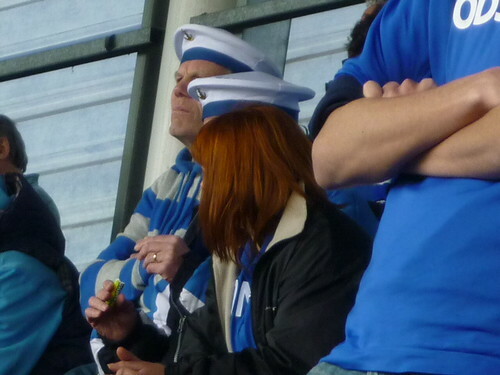 Lesson 11: when you're lucky enough to be Chairman, your hands are for sitting on during matches. 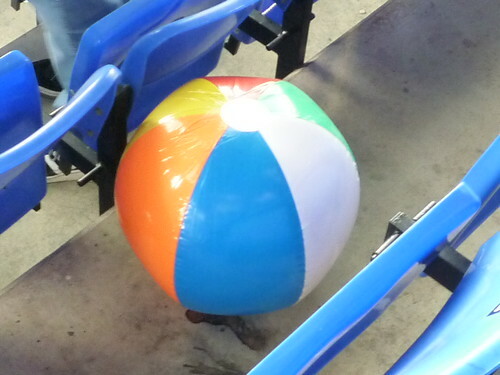 Behind the scenes - you can wave them around and kick as much a** as you want, if that's what floats your boat, as long as you remember to stay the right side of the law. 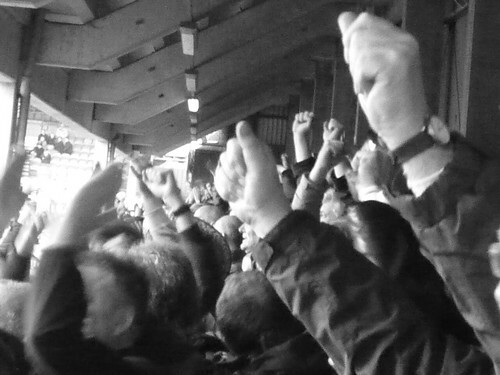 Lesson12: when at home take advantage of your biggest advantage - 18,000 noisy, rabid, angry, Pompey fans; stop making them boo you FFS! 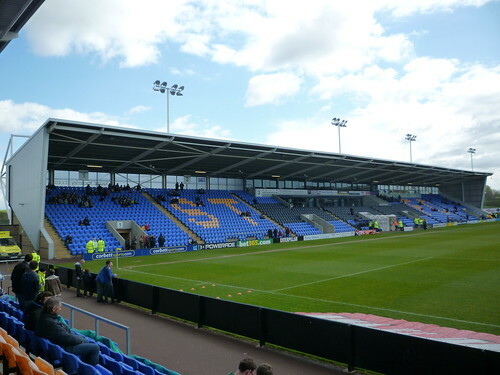 The 1600+ Pompey fans who travelled to Shrewsbury for the final League One match of the season created a real party atmosphere with their fancy dress and many inflatables. It was a great way to celebrate the start of a new era for the Club. 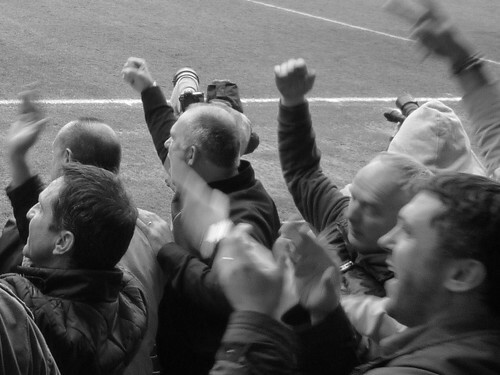 It started before kick-off and carried on well after the final whistle, despite the result. I hope you enjoy this selection from the many pictures I took on the day. 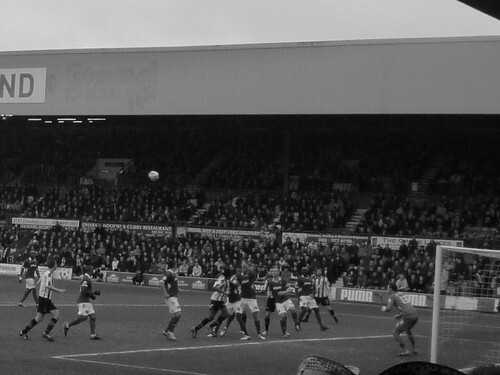 Captain Johnny Ertl looks on as the ball has been turned up! I love this picture! La la la la! La la la la! La la la la la la la! Portsmufffff! I think there might be a horse's head in this picture. Can you spot it? Alright, that's right, that's right, that's right that's right I really love your tiger light that's neat, that's neat, that's neat, that's neat I really love your tiger feet, I really love your tiger feet! 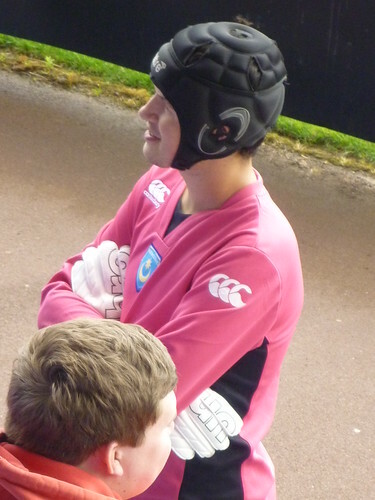 It's not Peter Cech (no really it isn't). 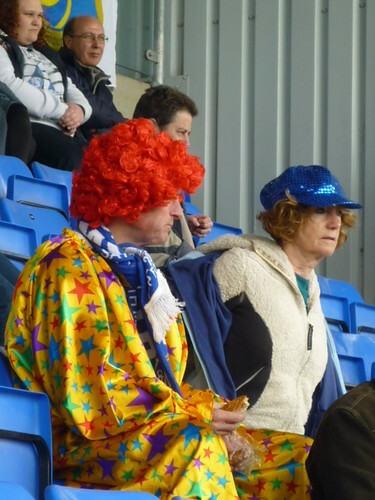 But you might buy your matchday programme from him at Fratton Park. Sailors III/III - fancy a fruit pastille? You want me to blow where?! 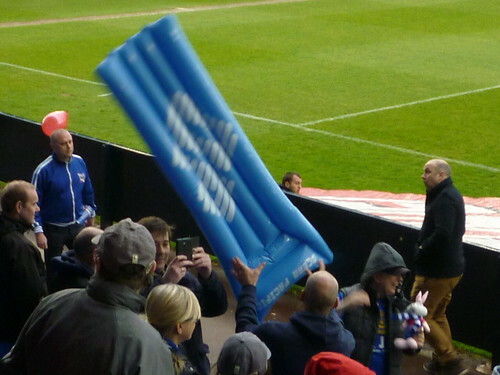 Biggest inflatable of the day. 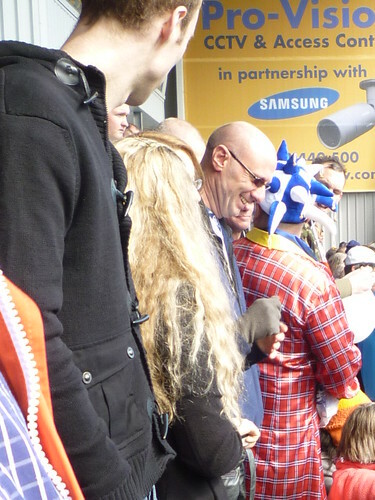 The best part about this picture is the steward's face. Love the way the inflatable has the adults mesmerized whilst the oblivious small boy in the red t-shirt does a dinosaur impression. Look, a man in a hoodie! 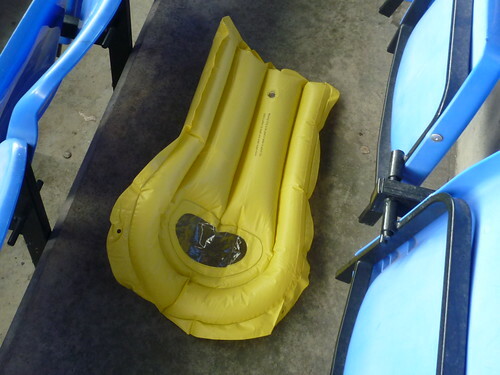 Every inflatable seemed to migrate to my seat! 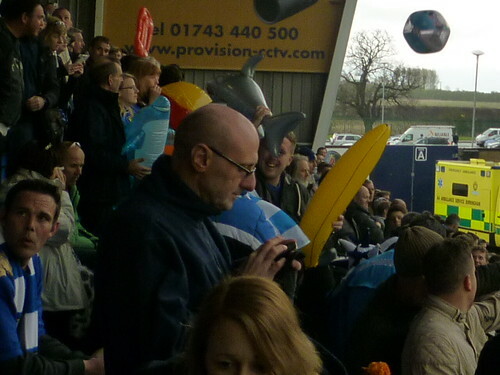 A beach ball, a banana and a shark and other various inflatables. 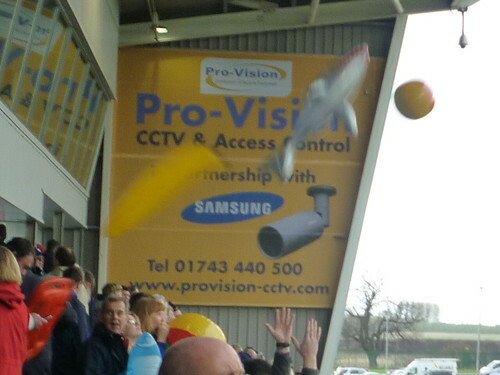 Pompey fan with a beach ball head juggles a banana a shark a beach ball and a CCTV camera. 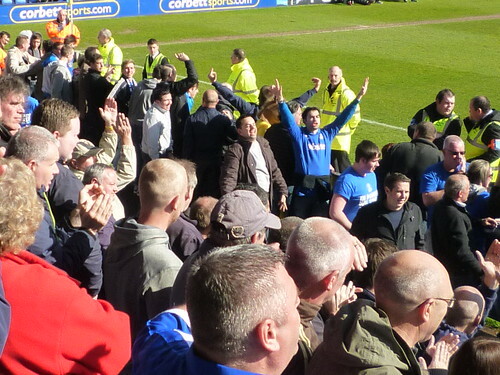 Here are some pictures I took during my trip to Shrewsbury to see Pompey's last game of the 2012-13 season. I followed the 'football parking' signs from the outskirts of town to Shire Hall and parked-up. As has happened to me before this season (i.e. Crewe) the parking signs seemed to just melt away the closer I got to my destination. These clubs must know I'm coming! 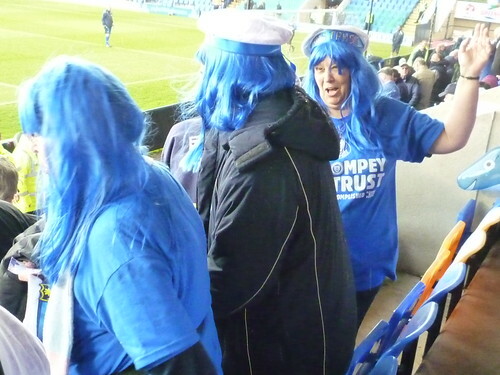 In fact I may have been the only Pompey fan using the car park as there were plenty of spare spaces! 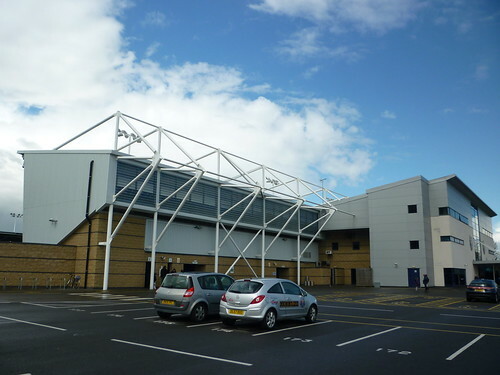 I would be interested to know if this is still an 'official football car park' (let me know, @PompeyChicken on Twitter). Oh well, it all worked out OK. I had a very pleasant conversation with a local cricketer, who had arrived at the same time as me to play on the Salop Unison Club Sports Ground next door to Shire Hall. He gave very clear directions to the ground which took about 15 minutes to walk. Despite the heavy rain and hail showers during the afternoon the cricket match was still being played when I returned to the car after the game. 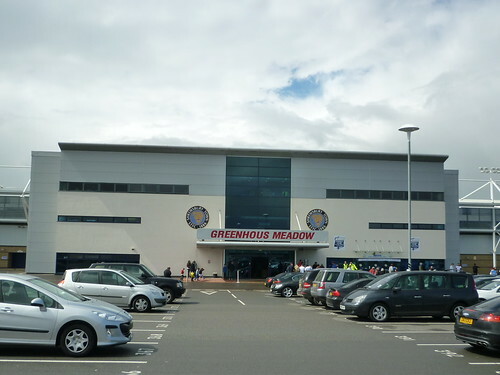 Greenhous Meadow is a modern ground that replaced the old Gay Meadow. 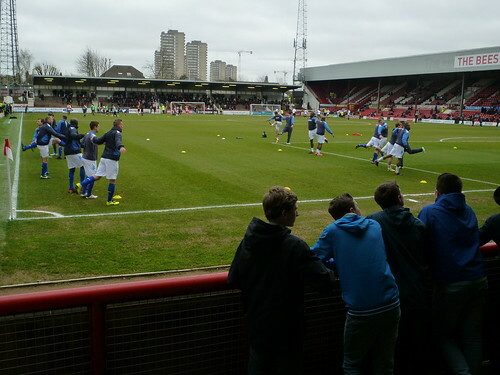 It is similar in style to Colchester United's ground. 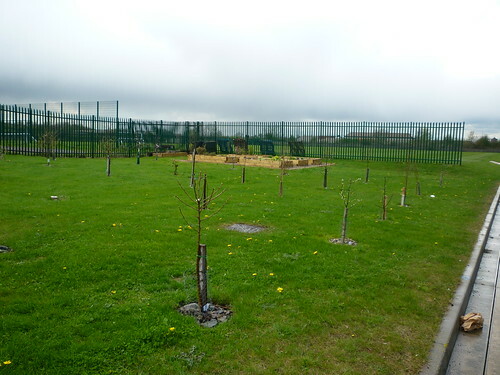 It is located on the outskirts of town alongside the railway line. 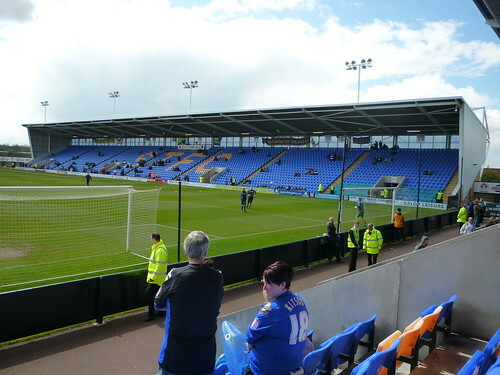 It has four stands which all stand alone, none of the corners are filled in. There is a large car park on site (permit holders only, numbered parking spaces I noted). 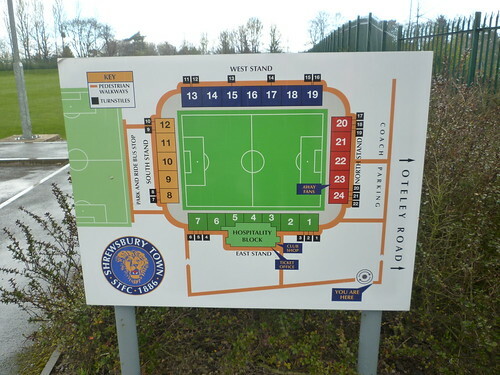 There is a training pitch next to the stadium (which is excellent), this notion of having the training pitch next to the stadium is a good one in my view, AFC Bournemouth have a similar set up. 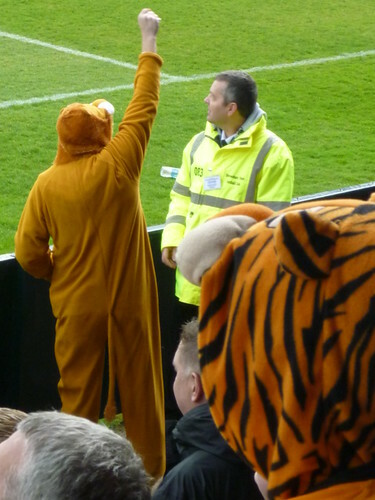 The stewards were friendly but I have to say I think the Police numbers were just a little bit over the top. The shrill of police sirens after the game as vehicle after vehicle sped along Otley Road in to town turned Shrewsbury in to something you might expect to see in London or Birmingham. 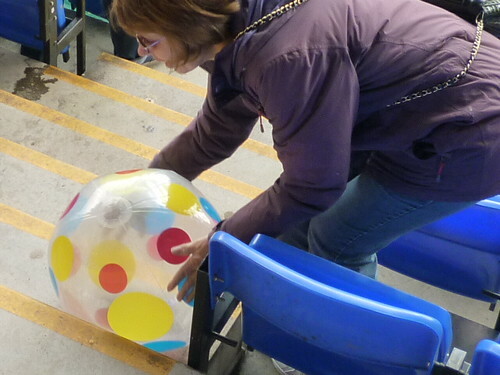 I guess we're going to experience this a lot as we travel to new and smaller grounds. Was there any trouble? I didn't see any. 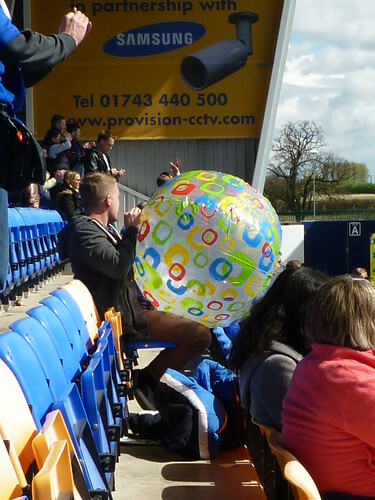 It was an enjoyable way to end the season in front of Shrewsbury's largest attendance of the season. I hope you enjoy the pictures. 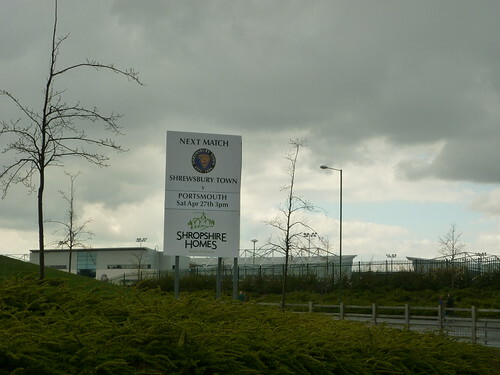 My first view of the Greenhous Meadow Stadium, taken from the railway bridge on Otley Road. Yay! 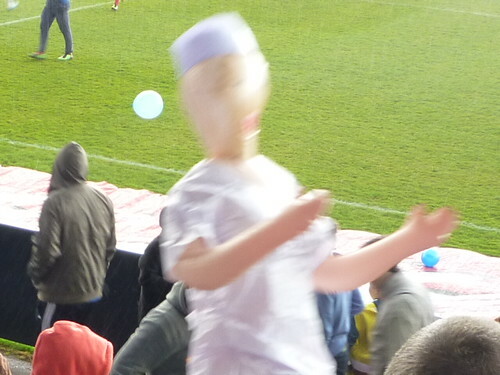 Pompey are in town. You are here, no really you are. 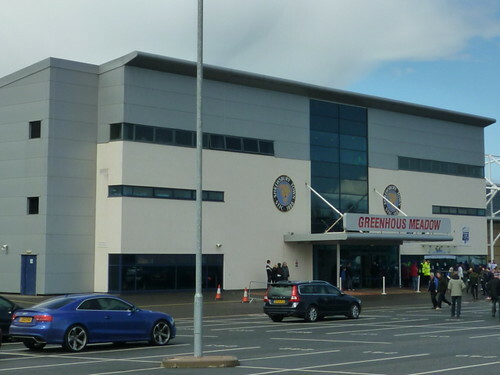 The main entrance to the Greenhous Meadow stadium. 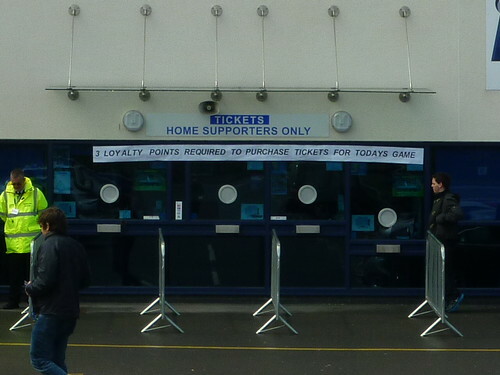 Three loyalty points required to watch Pompey! 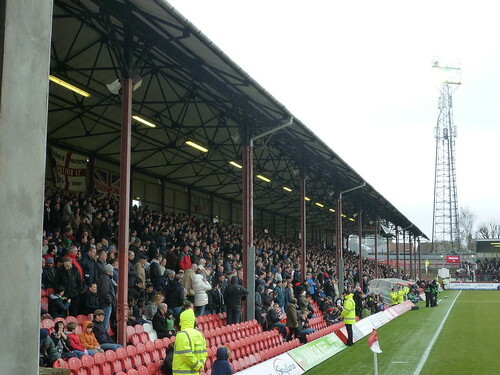 The corner of the East and North Stands. 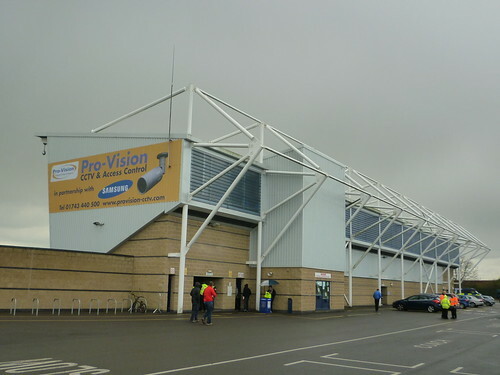 The North Stand (The Pro-Vision CCTV Stand), this was where the Pompey fans were situated. 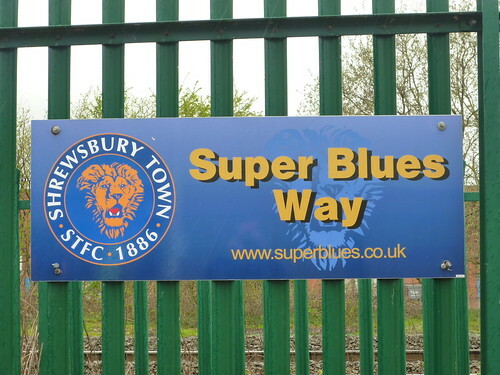 Not the only Super Blues in town today! PUP! 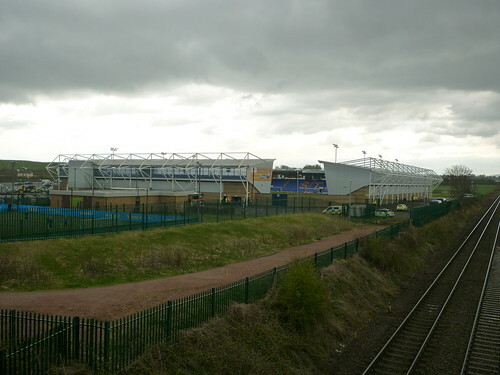 The back of the West Stand, this runs alongside the railway line. Initially I thought this was a memorial garden like I've seen at other grounds (e.g. 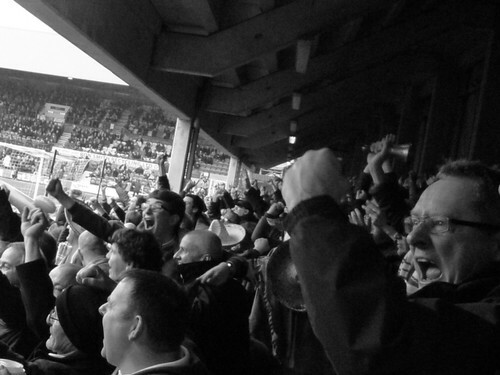 Coventry City). But I think it might be an orchard as those are apple trees you can see. 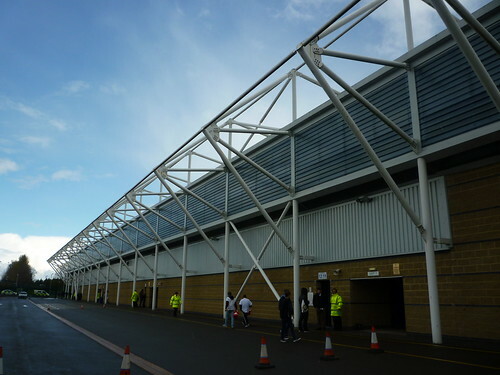 It was located at the South Stand end of the ground. Certainly an unusual find! If anyone has any more more information please let me know (@PompeyChicken on Twitter). In the background you can see the training pitch. 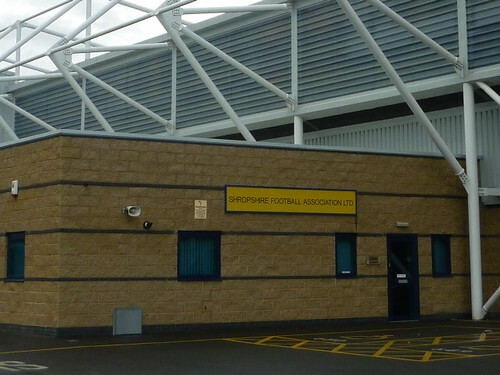 ...the home of the Shropshire Football Association! 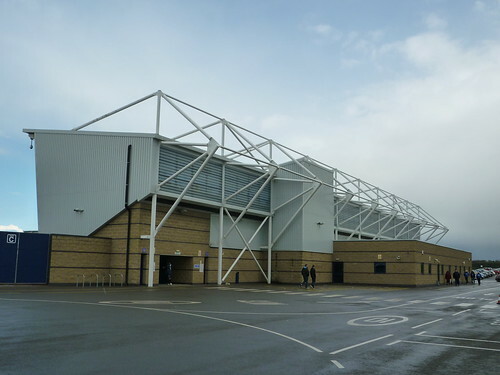 The corner of the East Stand with the main entrance to the right. And here's a closer view of the main entrance and hospitality suite. Jumpers for goalposts! 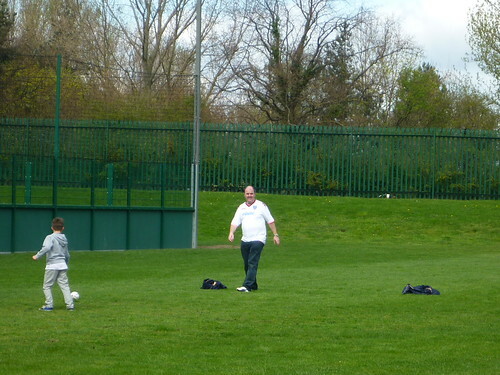 There was plenty of open grass on site to have a kick around. I love this picture! To the left you can see the edge of the five a side pitches that are also on site. 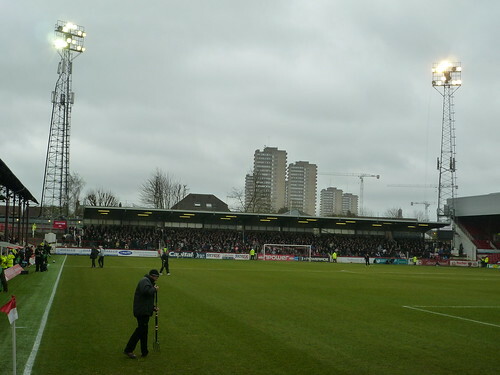 View of the East Stand. 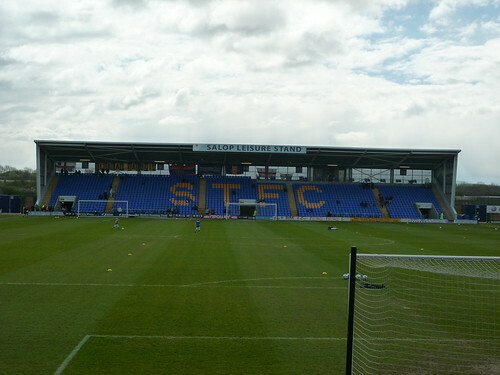 View of the South Stand - oh look it's known as The Salop Leisure Stand. 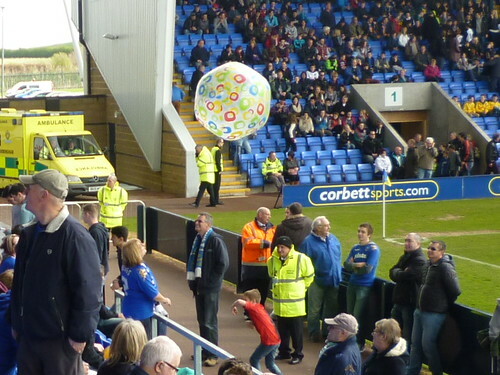 The Bill Axbey Stand just before the teams came out. 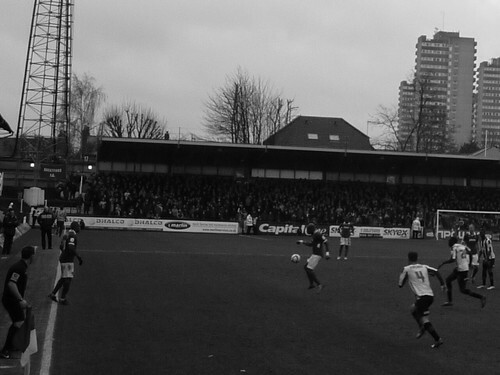 The Ealing Road Stand just before the teams came out. 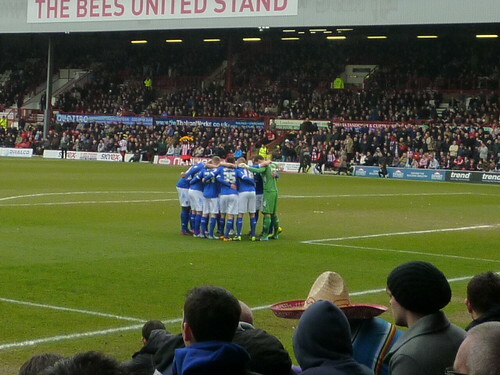 The Bees United Stand just before the teams came out. 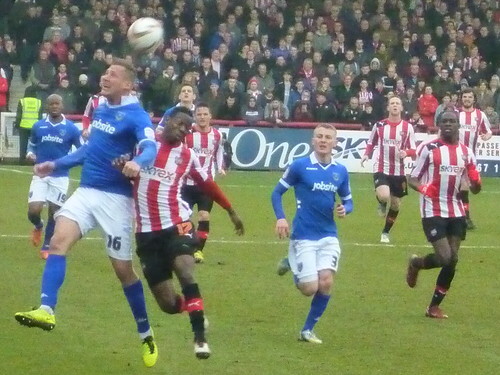 Defender Gabor Gyepes heads the ball away. Midfielder Therry Racon runs on to the ball. 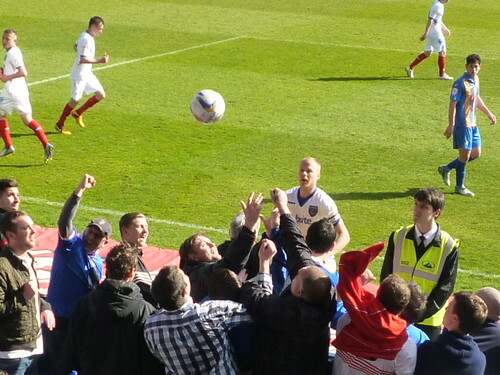 David Connolly, having run the length of the pitch, celebrates his excellent first half strike in front of the travelling Pompey fans with other Pompey players. 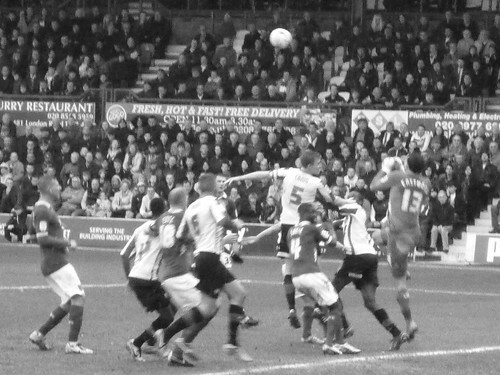 Simon Eastwood prepares to punch the ball away from the dangerzone. 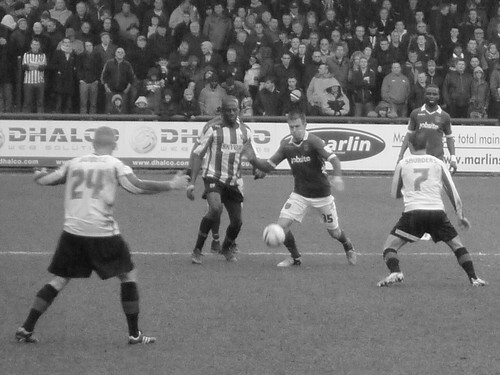 Midfielder Jed Wallace with the ball. 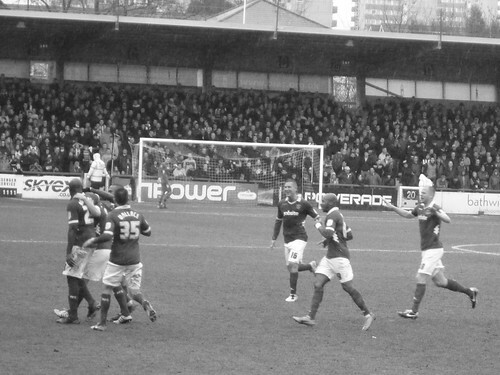 The players celebrate Shaun Cooper's second half goal which gave Pompey a 2-1 lead. 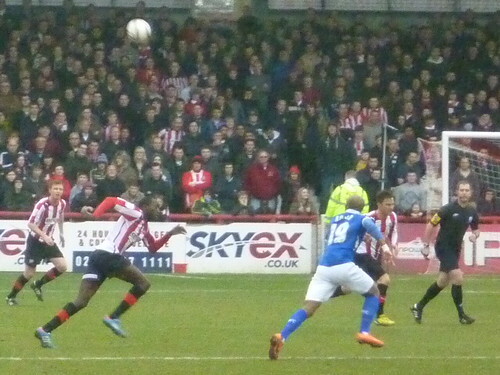 A Pompey throw-in, Racon receives the ball from Moutaouakil. 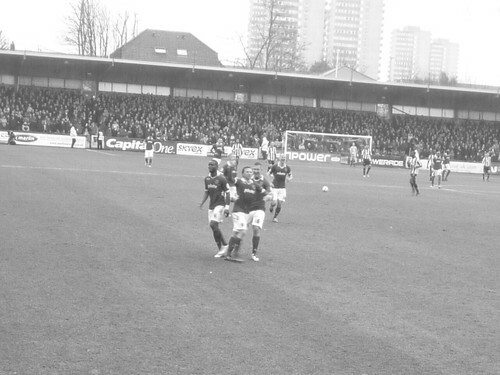 Dan Butler jogs over to take a corner. 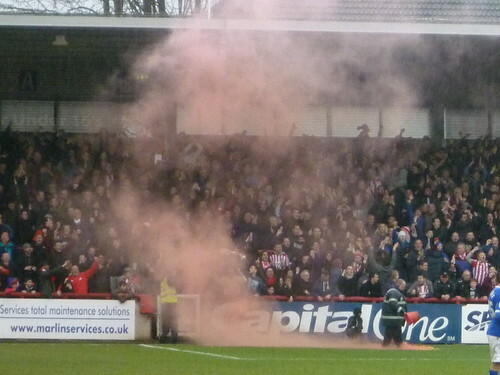 Brentford fans celebrate their second goal with a red smoke flare. Pompey team versus Brentford: Simon Eastwood, Yassin Moutaouakil, Sam Sodje, Gabor Gyepes, Dan Butler, Jed Wallace, Johnny Ertl, Therry Racon, Shaun Cooper (replaced by Jack Maloney in the 88th minute), Patrick Agyemang (replaced by John Akinde in the 74th minute) and David Connolly. Substitutes not used: Phil Smith, Adam Webster, Nick Awford, Liam Walker and Ashley Harris. 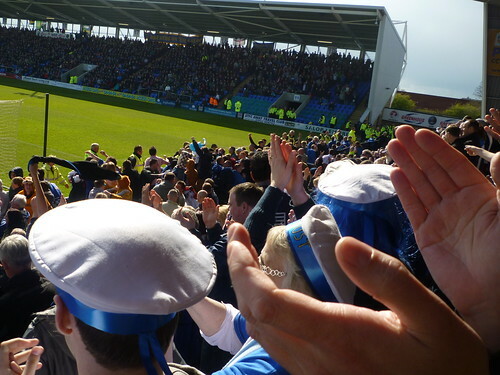 Attendance: 9,149 (including 1,796 Pompey fans). 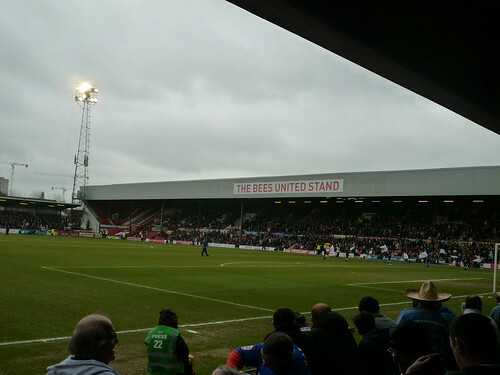 This was Brentford's largest league attendance of the season. 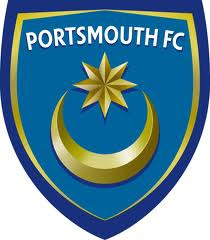 Born in the 1960s, grew up in the 1970s and started following Pompey in the 1980s. The rest as they say is history! I (sporadically) write blogs about football (Being Blue Through and Through), village cricket history (Memories of Bowerchalke Cricket Club) and HR (Through The Talent Twittens). 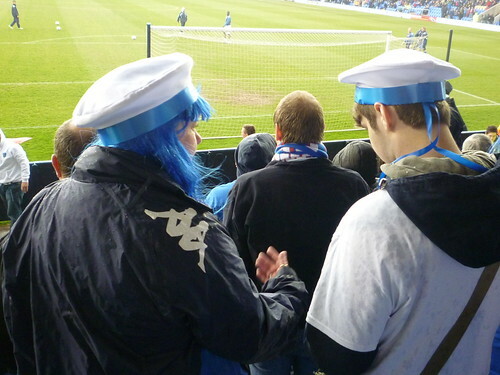 I'm a season ticket holder at Fratton Park and I try to get to as many away games as I can each season. I love football history, facts & figures, especially the FA Cup, and I have a collection of football programmes and books. I love cricket, especially Test Matches, and played regularly for many years (for Bishopstone Village CC, South Wilts CC, South Hants Touring CC and Portsmouth CC) before the old knees decided early in the 21st Century that enough was enough! I left IBM in 2015 after 27 years and now work in HR for WSCC. I've had a wide and varied career including technical, project management and leadership roles. You can follow me on Twitter: @KeithGulliver (work related), @PompeyChicken (football and cricket related) and @ThisLiberalAge (politics). You can find out more about my career history on LinkedIn. I also post pictures on Pinterest. 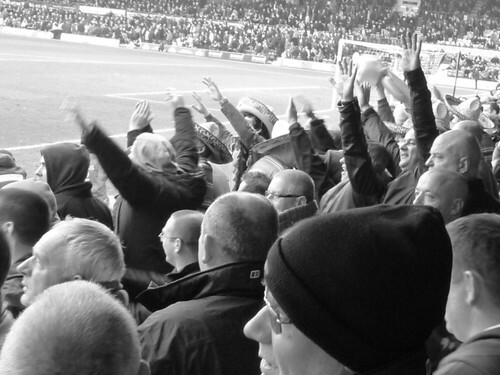 Pompey's 12th Man - Sign up! Manchester City vs Tottenham Live Blog – 20 April 2019 - Follow the Premier League game between Manchester City and Tottenham in our live blog here. 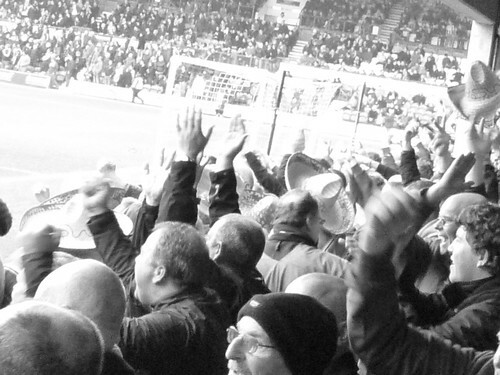 WALK THE 92 PROJECT | One Man, 92 Football Clubs And A Very Long Walk! jordy_drapes - Welcome to my blog. My name's Jordan Draper and as an aspiring Sports Journalist I tend to keep things sport related. Feel free to scroll through my work, comments on posts are more than welcome. Claim From Italy: Manchester United Readying Big Bid For Serie A Centre-Back - Manchester United are ready to put in a massive bid for Napoli centre-back Kalidou Koulibaly this summer. Toward a Somewhat More Possible Owl - Introducting Impossible Owls, a new essay collection by Brian Phillips. 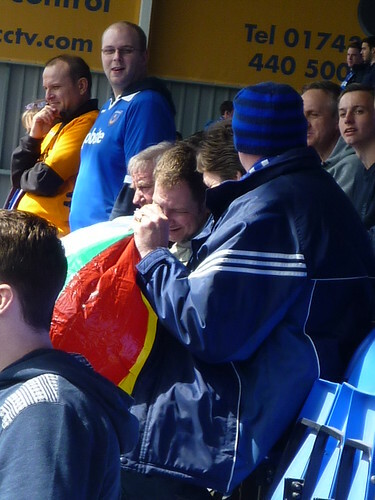 Awards 2015/16 - The Real FA Cup Awards: An Institution in our own heads.